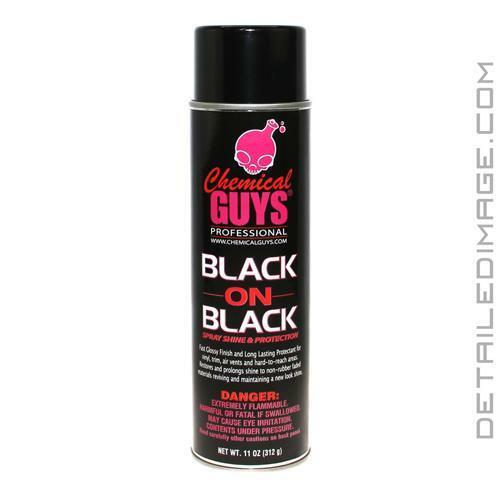 Chemical Guys Black on Black (earlier version was called "Fade 2 Black") makes black surfaces look truly black again quickly and simply. Just spray Black on Black on plastic and vinyl pieces and it quickly restores a deep black finish. Use it on your dashboard, doors, arm rests, bumpers, door handles, engine bay (hoses, casings, etc. ), exterior trim, mirrors and so much more. It restores a great like new finish and prevents fading and other damages with one easy application. Hold the bottle 8 - 10 inches away from the surface and apply a light spray. If you want a deeper and darker shine apply a second coat, but one is usually perfect for most detailers. Within minutes it is dry to the touch without that greasy and oily feeling. Just spray it on and walk away to restore your black trim. Try the Chemical Guys Fade 2 Black today! Fade 2 Black is used to provide a nice glossy finish and UV protection on all of your plastics, vinyl, rubber, and exterior trim. Specific areas would be in the engine bay where it is wonderful for dressing rubber hoses, plastic exterior trim and bumpers, plastic mirrors, windshield cowling, A/C vents inside the car, and my favorite application which is dressing the wheel wells. Because this 100% VOC compliant product comes in an aerosol spray can, it's also very easy to use for hard to reach places (engine bay, wheel wells). Fast Glossy Finish and Long Lasting Protections for plastics, vinyl, trim, air vents and hard-to-reach areas. Restores and prolongs shine to non-rubber faded materials reviving and maintaining a new look shine. Black on Black is the fastest and most effective spray shine and protectant dressing. An easy and time saving way to turn non-rubber faded grey parts on your auto, motorcycle, boat, plane or RV back to black. This non-greasy dry-to-the-touch formula sprays on fast and easy and any overspray is easily wiped away from glass and paint. Black on Black leaves trim, engine parts, moldings A/C vents and many other hard-to-reach areas black, shiny and protected. DIRECTIONS: Clean surface before use. Just spray on an buff or let dry to a "like new" shine. Bought an FJ Cruiser. Dealer prep was terrible. Engine bay and under body was covered in dried mud and grease. Used a de-greaser followed up by using this product on engine bay and under body. It looked like I spent hours detailing. So far, so good. Depends on what I need it for! Definitively is not for plastic surfaces where you need "deep, deep ultra black" appearance. Has a nice clean satin shine on my engine bay at first application, but I will check back in a month. The can now feels only half full, so the cost of item plus shipping equals very pricey. It had better last a long time and have a greasy to the touch feel on engine parts.